What is Success and why would anyone steal it? Several years ago we wrote a collection of stories to help our clients who were doing amazing things but kept feeling like someone kept stealing their success. Personally, I have felt that I had done so good but…where was the “proof”. What did I have to show for my success? And then I realised that the issue was a semantics challenge. Semantics? Otherwise known as the meaning of words. Clients, friends, colleagues consistently use words that create pictures in their mind. Too often those pictures are negative. 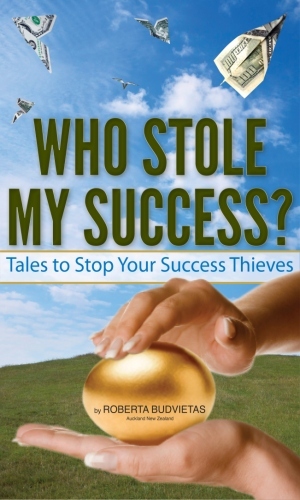 The stories in this book show just a few of the many ways we steal our own success or allow others to steal it. Words, actions, thoughts all have the power to steal from us. Even the definition we have for success affects your “success”. If you would like to explore more on this topic and see some of your own “thieves”, you can purchase the book from Amazon by clicking on the cover or you can email me in the contact page to set up a free 20 minute on-line consultation or to book series of mentoring sessions based on your needs and “thieves”.